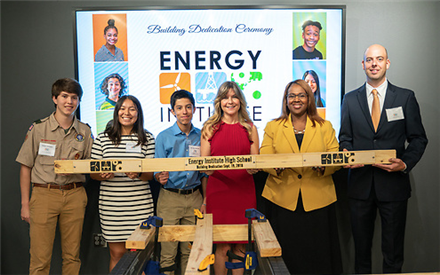 As principal of the first high school devoted to preparing students for careers in the energy field, my goal is to deliver extraordinary firsts in learning. I am thrilled to be the leader of a school that is participating in a thematic approach to the school experience – mingling the exploration of energy careers with cutting-edge education. What a rich learning experience it will be to connect students’ passion to their educational know-how! Read more. The new Energy Institute High School is simply magnificent! Sixteen-year-old Michael Sanchez thrives on intensity and pressure.